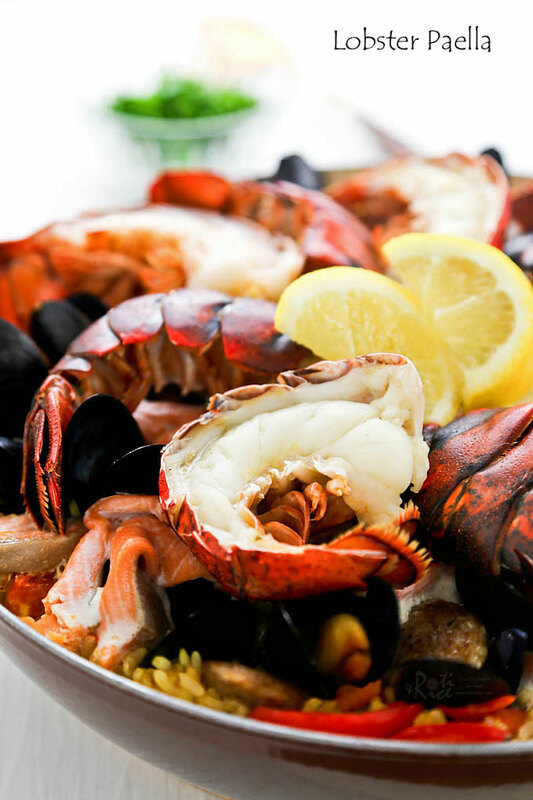 Wow family and friends with this delicious Lobster Paella studded with succulent lobster tails, mussels, salmon, and chorizo. They’ll be back for seconds! 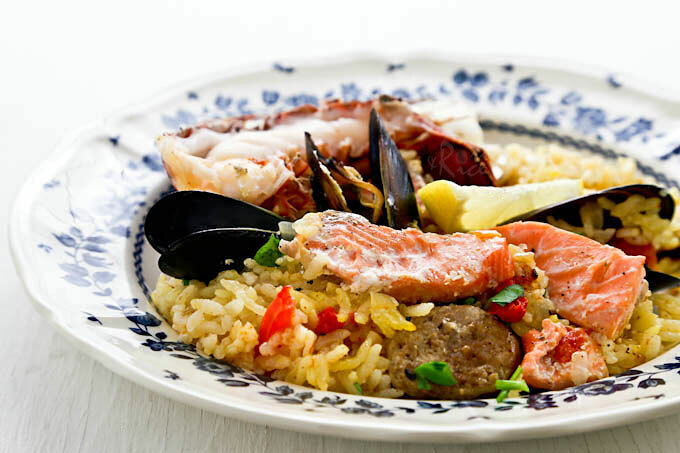 Paella is a renown Spanish dish with its characteristic golden colored rice flavored with saffron. There are many versions of paella and just about any protein and vegetable that goes well with rice can be added to the dish. It may contain chicken, pork, fish, shellfish, beans, peas, artichokes, or peppers. As such it can easily be tailored to your own liking. Since we were still in holiday mode, I made an over the top Lobster Paella for the family last weekend. I had bought 4 lobster tails when they were on sale and Ro-Ri San suggested that I used them for the paella. I am glad I took his suggestion as the dish turned out beautifully. The rice was plump and tasty and the seafood juicy and succulent. It was totally delicioso! Paella is best cooked in a large shallow pan. 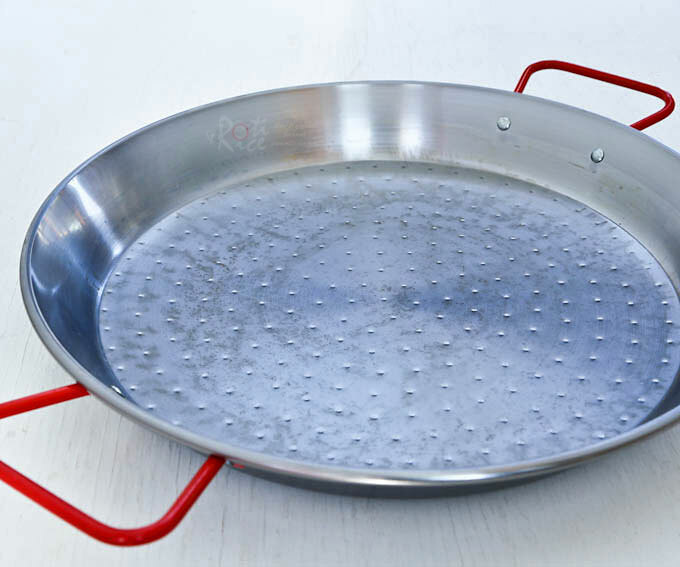 A paella pan has a wide, shallow cooking surface designed for the ease of sauteing meats and vegetables prior to adding rice. It is usually made of carbon steel which facilitates even heating and will become naturally seasoned with use. The wide handles make it easy to carry the pan from oven to table. 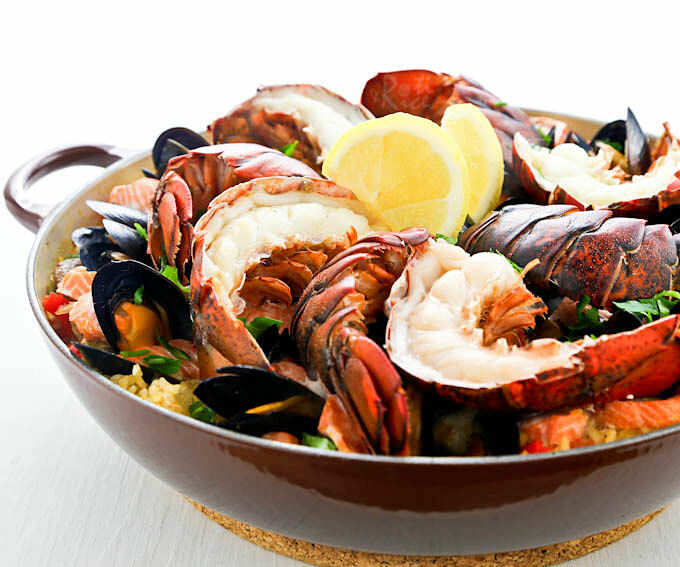 Paella pans come in a range of sizes – 13½-inch for 6 people; 15-inch for 8 people; 17-inch for 10 people; 22-inch for 16 people. They do not come with lids as paella was traditionally cooked over an open fire uncovered. 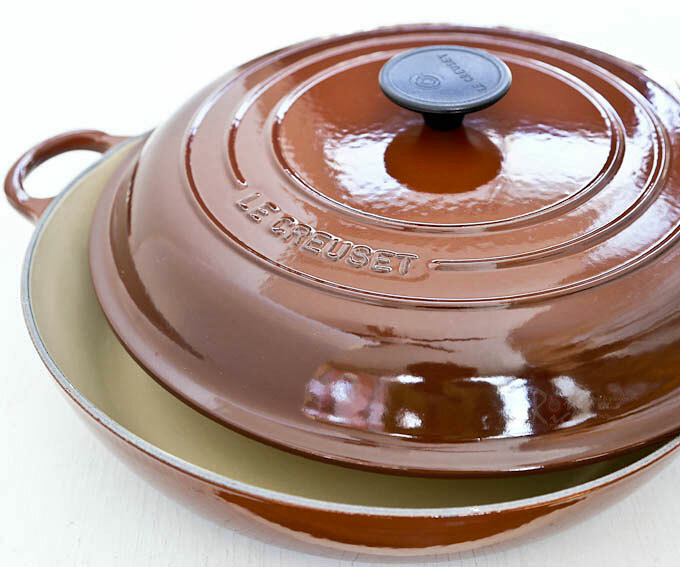 Instead of using my 13½ inch paella pan, I decided to try out my new Le Creuset 3¾ quart enameled cast iron buffet casserole. This gorgeous pan is about 12 inches in diameter and is slightly deeper than the paella pan. The cast iron construction provided even heating. There was a nice caramelized layer of toasted rice known as socarrat at the bottom of the pan when the dish was done. The types of rice recommended for paella are short grain Bomba and Callaspara. Since they are not to be found in my neck of the woods, I used short grain Calrose rice. Perhaps it is the holiday season but I also had a hard time getting chorizo this time. Definitely use chorizo where possible. When seafood is added to the pan, it gives out some liquid. I like to pop the entire pan into the oven to finish the cooking and dry out the liquid so that the rice remains fluffy and not soggy. 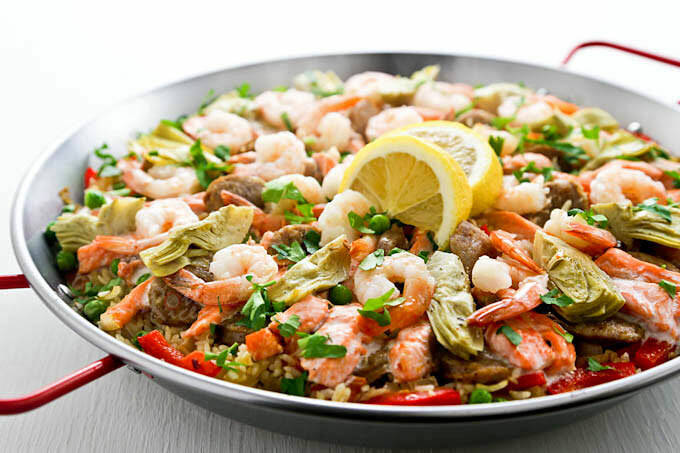 The recipe below was inspired by La Tienda’s Mixed Paella – Version II and Tyler Florence’s The Ultimate Paella. 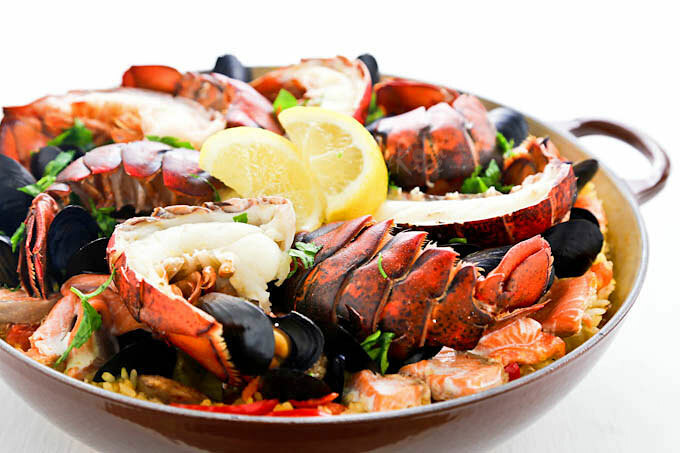 Wow family and friends with this delicious Lobster Paella studded with succulent lobster tails, mussels, salmon, and chorizo. They'll be back for seconds! Heat olive oil in a 34 cm paella or large shallow pan. Brown chorizo for about 3 to 4 minutes. Remove and set aside. Saute onions, garlic, red bell pepper, and tomatoes for 3 minutes. Add rice and stir fry for another 3 minutes. Pour in chicken stock and white wine. Crumble in the saffron. Season with salt and pepper. Return browned chorizo to the pan. Cover, reduce heat and allow it to simmer for 12 minutes. Arrange salmon and mussels all around the pan. Then place lobster halves on the top. Cover and cook for 6 minutes. Remove from oven and let it sit on stove top lightly covered with aluminum foil for 10 minutes. Oh wow what a luxurious looking paella! Thanks for the invite Emilie. I will check out your site soon. Wow, Biren! This is sheer luxury, lobster paella! I love all those delicious combination of components and I bet it must have been really tasty. Paella is something I can eat weekly but my children, for some reason, are just not keen. They like all the seafood, chicken and chorizo bit but not the flavoured rice. I just love the concept of one pan to cook and the same pan to serve, and the ease to make this. Lovely photography as usual!